Image © DC Comics. Written by Joshua Williamson, art by Rafa Sandoval, Jorndi Tarragona & Scott Hanna, colors by Tomeu Morey, letters by Steve Wands. First, it seems to me that the cover art for issues 58 and 59 were switched. This one would have worked perfectly for issue 58, that issue’s cover for this one. Gorilla Grodd and his secret African home of intelligent apes, Gorilla City were always fascinating to me as a child. Grodd is not here, but the issue takes place mostly in a devastated Gorilla City. Flash and Iris have arrived to find it mostly empty and spotted with gorilla corpses. 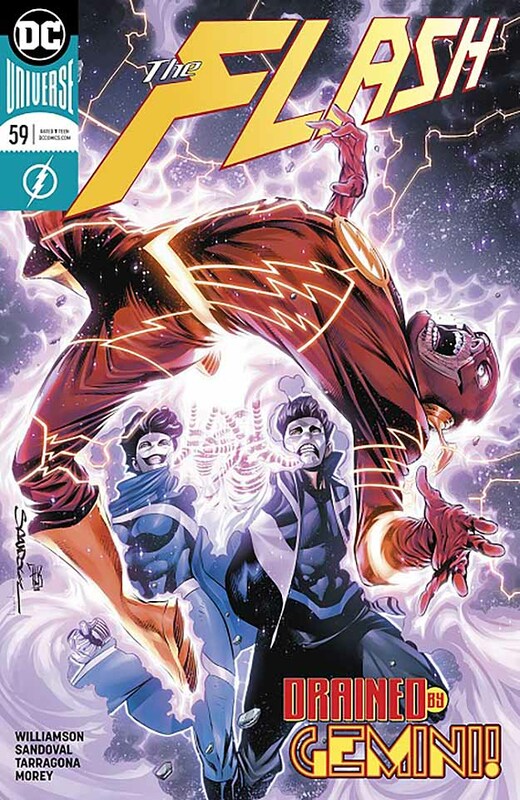 A few scientists remain underground, and there they show Flash a hologram record from their former leader Solovar, now deceased, that begins to explain more about the four Forces Barry Allen and Iris West are trying to understand. Back in Central City, a future version of Captain Cold is holding the fort against super-villain Razer while helping them out with data location. I could wish for more gorilla adventures, but next Flash and Iris are off to investigate a new emergence of the Strength Force in Corto Maltese. Last issue’s villains, Gemini, are in Gorilla City, too, making things worse for the few survivors. This entry was posted in Comics, Reviews on February 7, 2019 by Todd.